Today is presumed to be the birthday of the composer normally called Michael Praetorius. He was born Michael Schultze, the youngest son of a Lutheran pastor, in Creuzburg, in present-day Thuringia. His family name in German appears in various forms including Schultze, Schulte, Schultheiss, Schulz and Schulteis. Praetorius was the conventional Latinized form of this family name. After attending school in Torgau and Zerbst, he studied divinity and philosophy at the University of Frankfurt (Oder). He was fluent in a number of languages. 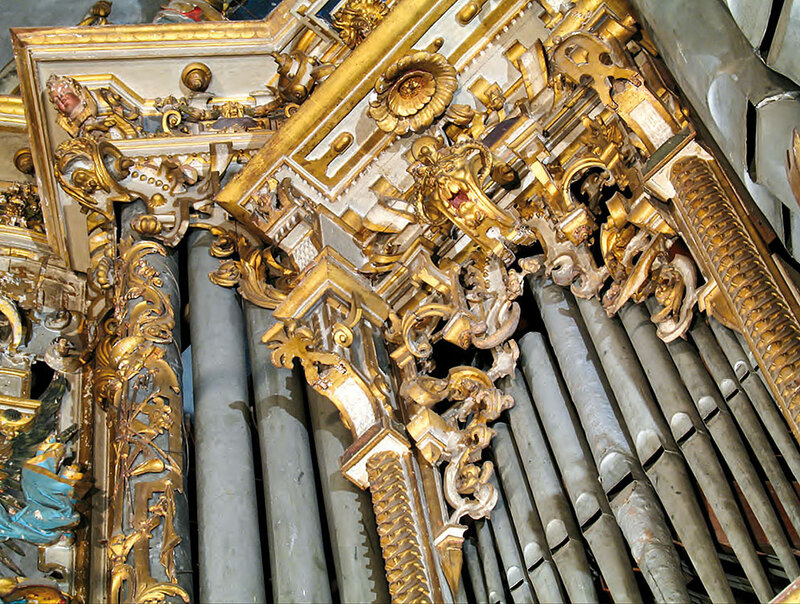 After receiving his musical education, from 1587 he served as organist at the Marienkirche in Frankfurt. From 1592/3 he served at the court in Wolfenbüttel, under the employ of Henry Julius, Duke of Brunswick-Lüneburg. He served in the duke’s State Orchestra, first as organist and later (from 1604) as Kapellmeister. His first compositions appeared around 1602/3. The motets of this collection were the first in Germany to make use of the new Italian performance practices, and as a result, they established him as a proficient composer. 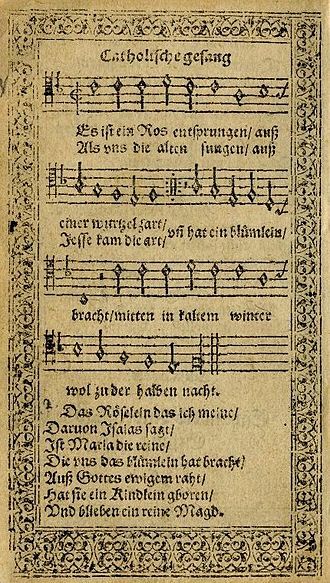 His “middle creative period” is marked by the nine parts of his Musae Sioniae (1605–10) and the 1611 published collections of liturgical music (masses, hymns, magnificats) which follow the German Protestant chorale style. He created these at the behest of a circle of orthodox Lutherans as well as the Duchess Elizabeth, who ruled the duchy in the duke’s absence. 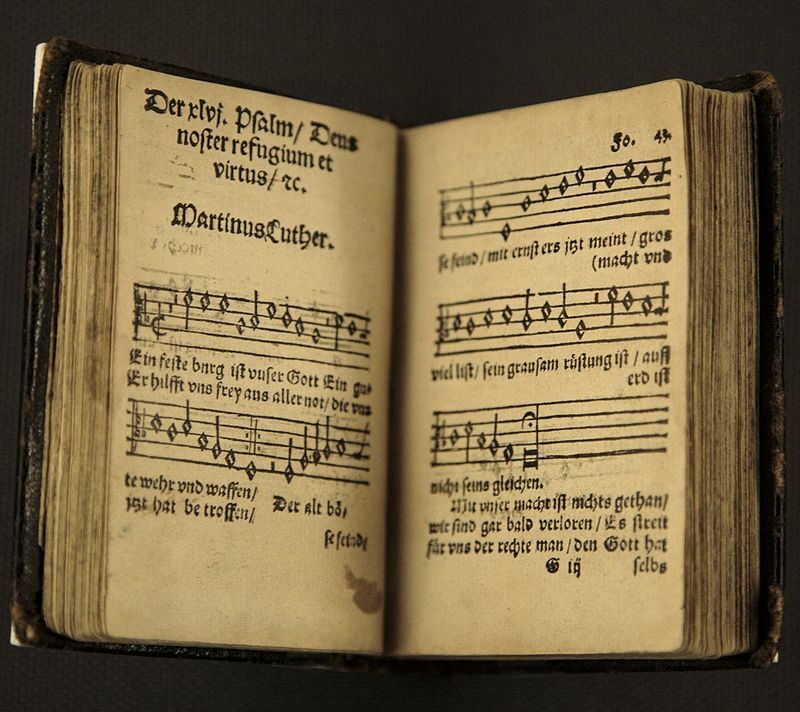 Henceforth Praetorius was known as a composer of sacred music. When the duke died in 1613 and was succeeded by Frederick Ulrich, Praetorius retained his employment. From 1613 he also worked at the court of John George I, Elector of Saxony at Dresden, where he was responsible for festive music. He was exposed to the latest Italian music, including the polychoral works of the Venetian School. His subsequent development of the form of the chorale concerto, particularly the polychoral variety, resulted directly from his familiarity with the music of such Venetians as Giovanni Gabrieli. The solo-voice, polychoral, and instrumental compositions Praetorius prepared for these events mark the high period of his artistic creativity. Until his death, Praetorius stayed at the court in Dresden, where he was made Kapellmeister von Haus aus and worked with Heinrich Schütz. Praetorius died on his 50th birthday, in Wolfenbüttel, Germany and is entombed in a vault beneath the organ of the Marienkirche there. Praetorius was a prolific composer; his compositions show the influence of Italian composers and his younger contemporary Heinrich Schütz. His works include the nine volume Musae Sioniae (1605–10), a collection of more than twelve hundred (ca. 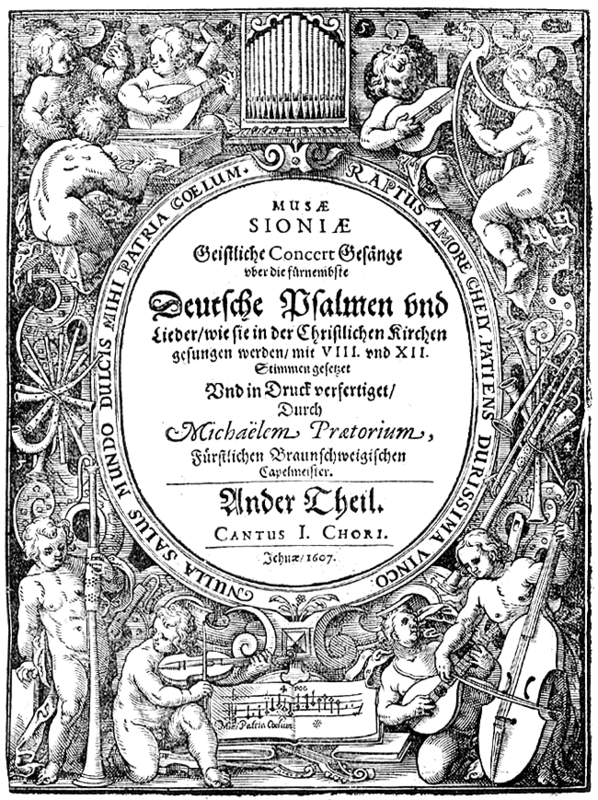 1244) chorale and song arrangements; many other works for the Lutheran church; and Terpsichore (1612), a compendium of more than 300 instrumental dances, which is both his most widely known work, and his sole surviving secular work. Many of Praetorius’ choral compositions were scored for several mini-choirs situated in several locations in the church for multi-phonic effect, with the conductor standing in the center of the church, visible to all the mini-choirs. 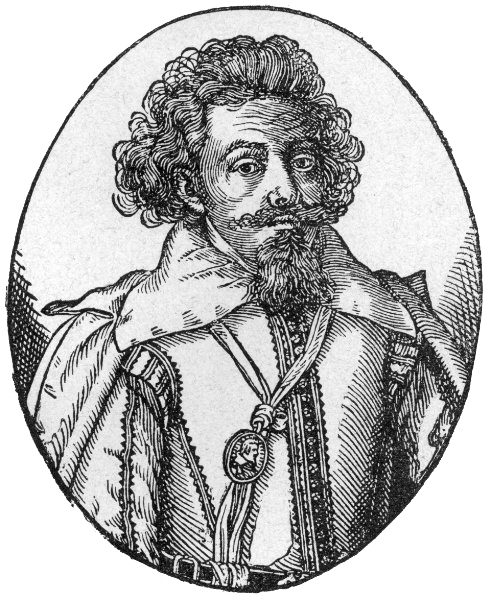 Praetorius was the greatest musical academic of his day and the Germanic writer of music best known to other 17th-century musicians. Although his original theoretical contributions were relatively few, with nowhere near the long-range impact of other 17th-century German writers, like Johannes Lippius, Christoph Bernhard or Joachim Burmeister, he compiled an encyclopedic record of contemporary musical practices. While Praetorius made some refinements to figured-bass practice and to tuning practice, his importance to scholars of the 17th century derives from his discussions of the normal use of instruments and voices in ensembles, the standard pitch of the time, and the state of modal, metrical, and fugal theory. His meticulous documentation of 17th-century practice was of inestimable value to the early-music revival of the 20th century. Praetorius wrote in a flowery manner (in German rather than the usual Latin) with long asides, polemics, and word-puzzles – all typical of 17th-century scholarly prose. As a lifelong committed Christian, he often regretted not taking holy orders but did write several theological tracts, which are now lost. As a Lutheran from a militantly Protestant family, he contributed greatly to the development of the vernacular liturgy, but also favored Italian compositional methods, performance practice and figured-bass notation. I always think of Praetorius at Christmas time because of his settings of many well-known Christmas works. His setting of “Es ist ein Ros entsprungen” is undoubtedly the best known and used. He also wrote settings for In Dulci Jubilo, Quem Pastores, and Puer Natus. It is important to note that he did not compose any of these pieces, yet his settings have remained popular. For a celebration I have chosen Thuringian potato dumplings. From the list of ingredients alone you would be forgiven for thinking that they are simple to make. They are not. In Germany you can buy mixes that simplify the process. Wash and peel the potatoes. Fill a large bowl with lukewarm water and add a splash of vinegar. Grate 2/3 of the potatoes into the vinegar water. Carefully pour out the water and add new water and vinegar. Repeat. Transfer the grated potato to a cloth dish towel and squeeze out the liquid over the bowl. Reserve the liquid. The starch will settle on the bottom of the bowl and will be used later. Leave the potatoes in the dish towel until needed. Remove the crust from the bread, cut it into small cubes and sauté the cubes in the butter until golden brown. Boil the remaining 1/3 of the potatoes in lightly salted water until tender. Drain the potatoes but not completely. Leave some liquid in the pot and mash the potatoes until they form a moist purée. Bring the purée to a boil. Carefully drain the vinegar water from the bowl leaving only the settled starch. Add the grated raw potatoes and a pinch of salt. Combine the ingredients well. 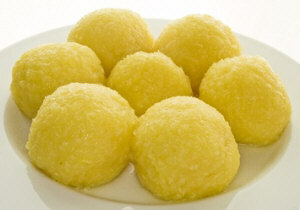 Using a hand-held electric mixer, gradually incorporate the boiling potato purée. Beat the mixture until it readily comes off the sides of the bowl. 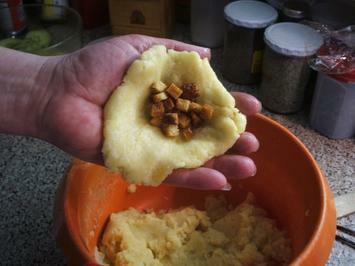 Wet your hands and shape the potato mixture into even-sized round dumplings. Press 2-3 croutons into the center of each dumpling. Using a slotted spoon, carefully lower the dumplings into gently simmering water (rapidly boiling water will cause the dumplings to disintegrate) and cook on low heat for about 20 minutes.